Fire is an extremely destructive force, causing thousands of injuries and deaths, and billions in property damage, each year in the United States. In fact, structure fires caused 13,000 injuries, 2,685 fatalities, and $10.3 billion in property damage in 2015 alone, according to the National Fire Protection Association (NFPA). Adding insult to injury is the fact that many devastating structure fires could have been prevented had the property owner taken reasonable safety precautions. When property owners fail in their responsibility to ensure the safety of residents and lawful visitors on their premises, they may be held liable for the accidents and injuries that occur as a result. 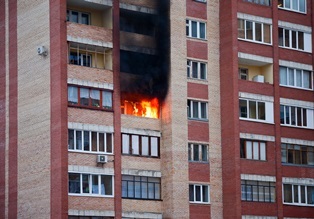 If you were injured in a fire caused by property owner negligence, you may be entitled to compensation. Install smoke detectors and check them twice a year to ensure they are working properly. Install or regularly maintain sprinkler systems. Have ample fire extinguishers on the premises. Install or maintain fire escape systems as appropriate. Post proper signage throughout the premises to instruct residents and visitors on how to use the building's fire escape systems. Fires can cause catastrophic injuries, some of which may be permanently disabling, disfiguring, or even deadly. While burns may be the first type of injury that comes to mind when thinking of serious fires, burns are far from the only injuries that fire victims can sustain. Other common injuries associated with fires include smoke inhalation, asphyxiation, and internal injuries. Those who sustained injuries in fires caused by property owner negligence may be able to seek compensation for medical expenses related to the fire, as well as lost wages, loss of earning potential, physical pain and suffering, mental anguish, scarring, disfigurement, and more. The property owner was aware that the premises was unsafe. Despite being aware of the unsafe conditions, the property owner failed to take the appropriate steps to repair the problem. The unsafe condition in question caused a fire. The victim suffered injuries as a direct result of that fire. Do You Need a Premises Liability Attorney? If you were injured, or lost a loved one, in a fire that you believe was the result of the property owner's negligence, you may be eligible for compensation for a wide range of damages—if you can prove that negligence took place. For those without prior legal experience, this can be a bit of a tall order. Fortunately, a personal injury attorney with experience handling premises liability cases can help their clients navigate the litigation process and fight for the financial recovery they deserve. Do you have questions about a potential premises liability fire case? Contact the Morris James Personal Injury Group to schedule a free, no-obligation initial consultation to discuss the details of your case with a legal professional.